Camilla Chappers: Is Daniel Craig the best Bond ever? The third outing of Daniel Craig as British MI6 operative James Bond has just been released in the UK, soon to be worldwide. Everyone is asking it so... is Daniel Craig the best Bond ever? There's been plenty of debate on this topic ever since Craig's first outing in the wonderful Casino Royale, and this has been reinforced with the quite frankly brilliant Skyfall, with a stellar performance worthy of all the awards. And even though Quantum of Solace was a disappointment, Craig did attempt to salvage the poor script with a good performance. But is he really potentially the best Bond there has ever been? But then are some downsides to what would be this God. 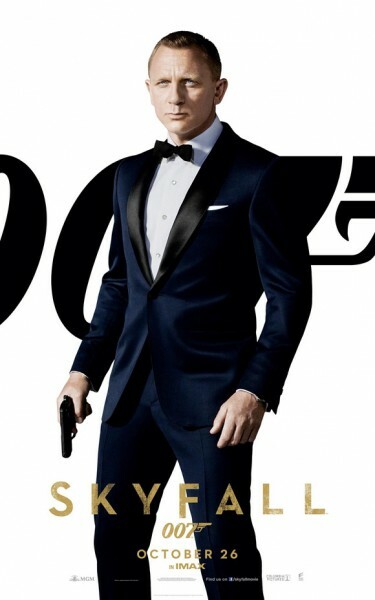 He drew a lot of criticism when he was first cast as the new 007, as he was the first 'blond' Bond. Die-hard fans threatened to boycott his films, hate websites were created... because of the colour of his hair?! (I know right...) But I guess in a way, I see what all of these fans meant. The creator of 007, Ian Fleming, created a dark-haired, handsome and tall James Bond - the criteria which other actors before Craig had filled. Craig on the other hand was blond-haired and only 5'10 in height (certainly not lacking in the looks department though). Then you have the public's opinion; many see Sean Connery as the best, and I agree to sum degree of that. Connery was the first original Bond and as such, set the tone for how Bond should be; all of the 'swagger' Bond should have when killing villains, or seducing pretty woman or even drinking a Martini shaken or stirred. He also was in some of the best Bond films to date, such as Goldfinger and From Russia With Love - many people believe he is the best Bond. Yet, public opinion is changing. I recently did an audio piece for my course about the song for Skyfall by ADELE - also named Skyfall - and me and my colleagues also asked the public what their favourite Bond was. Low and behold, the two top names were Daniel Craig and Sean Connery. But then you have other former Bond actors such as Roger Moore labelling Craig as the "best Bond ever". One woman I interviewed even said she didn't think much of Connery as a person so she preferred Pierce Bronson as Bond. Hmm. So in conclusion, is Daniel Craig the best Bond? Potentially, yes; but Craig's Bond is very much different to Sean Connery's, they have made their Bonds their own and just as spectacular as one other. If Daniel Craig carries on putting in the wonderful performances he has done in his first three Bond films, then I have no doubt he will eclipse Connery to be the best Bond. Would love to hear your opinions - so please, feel free to discuss! Go see Skyfall now in UK cinemas and out in US cinemas from 9th of November.